Now offering renovated apartments: each include new white shaker cabinets, quartz countertops, tile backsplash, and wood-plank flooring! Call Today to learn more! Nestled comfortably in one of Chicagoland’s most well-known northwestern suburbs, Village Green of Schaumburg is the only choice for apartments in Schaumburg, IL. While many know the city as home to the area’s ever-popular IKEA store, Village Green of Schaumburg has made a name for itself by providing residents with an unparalleled luxury living experience. Our community offers spacious one- and two-bedroom floor plans complimented by resort-class amenities and an award-winning management team. We also provide easy access to public transportation and local expressways, and for parents and students, Village Green of Schaumburg is located within the prestigious Schaumburg Township Elementary School District 54. At Village Green of Schaumburg, each apartment home features the best in resident amenities as well as a choice of two custom finishes. Spaces are light and airy due to huge oversized windows, and residents absolutely revel in the abundant walk-in closet space each floor plan provides. Our apartment homes feature contemporary gourmet kitchens, and for added tranquility, sound conditioned walls. Washer and dryer units are available in every unit, and our separate dining rooms are perfect to host dinner for friends and family. Village Green of Schaumburg residents also have the unique opportunity to further design and customize their unit. V.A.L.U. added luxury upgrades are available, and select homes feature private patio or balcony options, steep vaulted ceilings, and private entrances. Village Green of Schaumburg is also a completely pet-friendly community, welcoming both cats and small dogs. If our location and apartment amenities aren’t enough to wow you, take some time to tour our amazing community grounds. Located in a professionally landscaped, wooded setting, Village Green of Schaumburg boasts serene lake views and provides access to a nature and fitness trail. The property also houses a newly remodeled 24-hour professional center, heated outdoor pool, and outdoor fountain and hot tub. Children spend hours climbing on our newly installed playground, and our state-of-the-art clubroom is a favorite for adults. For added recreation, Village Green of Schaumburg hosts planned social activities, and the property is also located just minutes from the city’s most popular attractions including but not limited to O’Hare Airport and the local IKEA store. 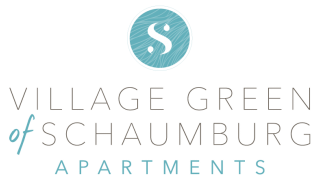 When searching for Schaumburg, IL apartments, look no further than Village Green of Schaumburg. Tour today and discover the best apartments for rent Schaumburg, IL has to offer.